Cobnuts are cultivated hazelnuts and the Kentish Cobnut is one of the most popular varieties. Kentish Cobnuts have a medium-large oval shaped nut, are crunchy in texture and have a mildly sweet flavour. 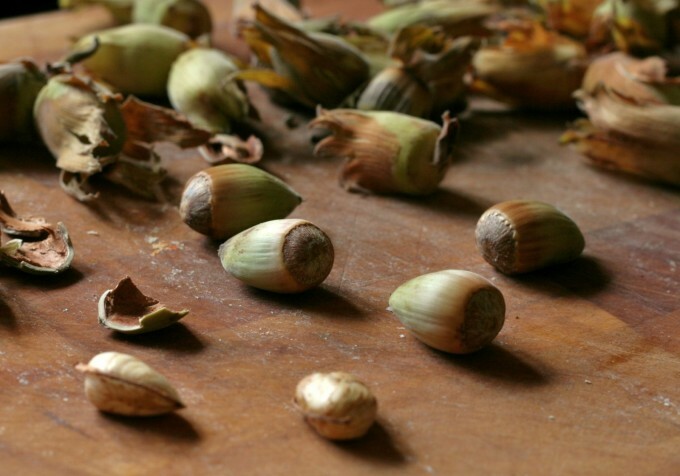 Cobnuts are sold fresh and green when they ripen during August to October, and brown and dry for the rest of year. The cultivation of hazelnuts in Britain dates back to at least the 16th Century. The Kentish Cobnut was first called Lambert’s Filbert – a Filbert is distinguished from a cobnut in that its husk is longer than the nut. The Kentish Cobnut is thought to have been introduced around 1830 and the Sevenoaks to Maidstone district of West Kent is the main area of cobnut production. The ragstone rock within the area produces a free-draining fertile soil with a neutral pH that seems to be particularly favourable for hazelnut production. In 1913, there were about 3,000 ha. of hazelnuts being grown in orchards or “plats” as they are known, within the county of Kent. The decline of the Kentish Cobnut was closely linked to the decline in the area’s hop growing. The cobnuts and hops both ripened around the same time and the cobnuts were often picked by the hop pickers (largely for their own consumption).